I hope you have enjoyed the Babywise Success Stories Week this year! I love to hear from you all on the successes you are having and how you are making Babywise work in your family. I love spreading the message that there are many parents out there who use Babywise and love it. There are so many benefits we have seen in our children from using Babywise and the methods beyond. We have well-rested children who are predictable. We have had help in sleep training, feeding, scheduling, discipline, educating, and more. We have had guidance we need on getting our kids to sleep in their childrens beds (not our bed–that was a goal of ours before we even heard the word “Babywise”). We have had great ideas to apply for everything from potty training to character training. It has helped us be intentional in parenting and forced us to look at our main values and goals and set a plan to achieve these. If you can and feel inclined, continue sharing your success throughout the year. 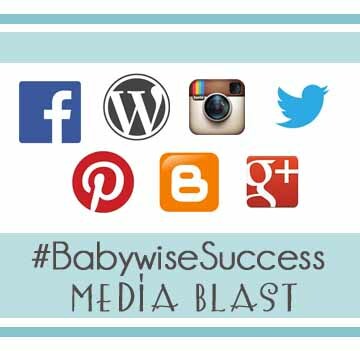 When you are sharing something on Facebook, Instagram, Pinterest, Twitter, your blog, etc., that is a result of your efforts with Babywise, share it with a #BabywiseSuccess. I don’t think we should feel afraid to share what works for us, and with our united voices, we can spread the word that Babywise babies are actually happy, healthy babies.